People always want to know what makes Detroit so special. We all know that there are million reasons to our love our fair city, but one of the best reason to love Detroit is that you can see great live music any day of the week! 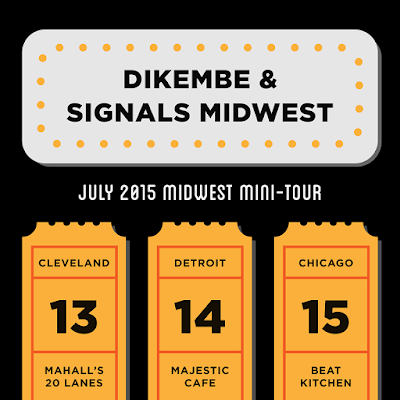 This Tuesday, July 14th Black Iris Booking will be bringing Signals Midwest to town alongside Dikembe, What Moon Things and Mover//Shaker. Black Iris Booking is known for their solid punk and rock and roll shows, and this one is no exception. Empire Empire was supposed to be performing, but had to drop off the tour for personal reasons. But don't worry, they saved it by adding Signals Midwest to the lineup, so you can still have fun this Tuesday. Tickets for the show are only $10 in advance, you can purchase them here. We also have one pair of tickets to giveaway to the show. If you would like to enter to win a pair of tickets to the show, please email your full name to hipindetroit@gmail.com with the subject line #blackirisbooking. We will email the winner details on how to claim their tickets early Tuesday morning. Other people might work for the weekend, but in Detroit once the sun goes down the amps go up and the music gets loud, no matter what day it is and that's the way we like it!